Jigalong is a remote Australian Indigenous community of approximately 427 people located in Western Australia. 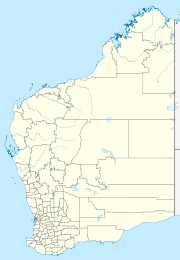 Jigalong is in the Pilbara region of Western Australia, approximately 165 kilometres (103 mi) east of the town of Newman in the Shire of East Pilbara local government area. The community is located in an Aboriginal Lands Trust reserve on the western edge of the Little Sandy Desert. The 2011 Australian Census recorded the population of Jigalong as 427 people, of which 76.1% were Aboriginal. The Jigalong Remote Community School provides education from kindergarten to Year 12 level, with six teachers for a student enrolment of around 120 children. The community has a medical centre, but patients with serious illnesses and injury are usually flown to Port Hedland—400 kilometres (250 mi) north west of Jigalong—by the Royal Flying Doctor Service. Jigalong was established in 1907, as the location for a maintenance and rations store for workmen constructing the Rabbit-proof fence. In the 1930s, it was used as a camel-breeding site, but this use was abandoned once the motor car superseded the camel as a mode of transport. In 1947, the land was granted to the Apostolic Church, who used it as a Christian mission, and set up the Aboriginal community. The land was returned to the Australian government in 1969, and was granted to the Martu people in 1974. The community is covered by the Registered Nyiyaparli Title claim (WC05/6). Jigalong Layout Plan No.2 was prepared in accordance with State Planning Policy 3.2 Aboriginal Settlements, and was endorsed by the community in 2005 and the WAPC in 2006. The layout plan map-set and background report can be viewed at Planning Western Australia official site. Jigalong was the home of Molly Craig, a young Aboriginal girl whose 1,600 kilometre trek with her sister Daisy from the Moore River Native Settlement back to Jigalong was described in the book Follow the Rabbit-Proof Fence by Molly's daughter Doris Pilkington Garimara. In 2002, the book was made into a film, Rabbit-Proof Fence, directed by Phillip Noyce, and the film's world premiere was held in the town. ^ a b Australian Bureau of Statistics (31 October 2012). "Jigalong (Indigenous Location)". 2011 Census QuickStats. Retrieved 2012-08-04. ^ Jigalong Community Layout Plan No. 2 Planning Report & Provisions, Western Australian Planning Commission, September 2005. ^ Jigalong Remote Community School, TeachLive, 2005. ^ The Royal Flying Doctor Service of Australia (RFDS) and the people we are proud to serve, Royal Flying Doctor Service, 12 February 2008. ^ Education and School — State Records Office, State Records Office of Western Australia. ^ Thompson, Peter: Film: Rabbit-Proof Fence, Sunday (Nine Network), 24 February 2002. This page was last edited on 27 December 2018, at 12:33 (UTC).